The above info came from Mimi Jordan, and was edited by yours truly (contact me). The image came from Tinypic.com. 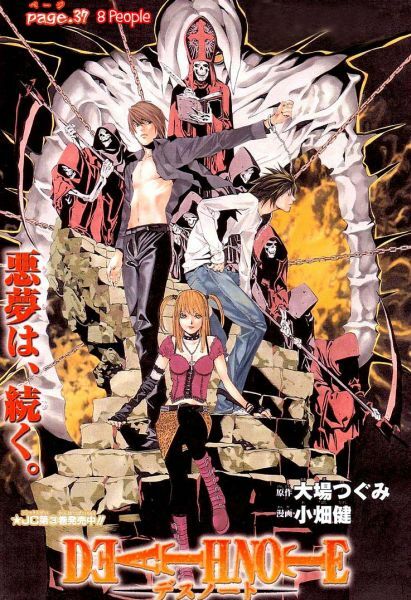 Light Yagami, an intelligent high school student with a loving family and high social status is bored with his life. Being the son of a Police Detective, he becomes despondent with the constant crimes he witnesses on the news. One day, he finds a notebook entitled the "Death Note" which has the power to kill anyone whose name is written into it. He doubts the book's power until he tests it out for himself, and to his shock it proves to work with deadly efficiency. As more and more names are written into the Death Note, the world takes attention to the massive number of criminal deaths. The International Police Organization scrambles to find out who is responsible and how the murders are being committed. Gaining the help of the eccentric master detective known as "L," he makes his presence known to Light (known to the world as "Kira"), resulting in a massive battle of wits between the two minds. Who will win and who will die first? And what type of "Justice" will ultimately prevail in the end? Death Note is a 12 volume manga series (plus one extra 13th issue called "How to Read 13") that has recently been turned into a 37 episode anime series (plus one 3-hour special) and has a live-action movie that was released in Japan June 17th, 2006. It's about a high school student by the name of Raito. One day he finds a strange book called Death Note. The book reads that if a human's name is written in the Note then that person will die in 40 seconds. At first, Raito didn't believe this, until a few experiments proved him wrong. And also, meeting the Shinigami Ryuk helped him believe in the Note. After Raito learns a bit more about the Note he begins to 'Cleanse the World', as he puts it. He kills off all the criminals and gains the nickname 'Kira' in the process. Now he has to cleanse the world, and help the Japanese police force try and capture 'Kira' along side Raito's new suspicious enemy who goes simply by the name, L.
The above description came from Mimi Jordan, and was edited by yours truly (contact me).